This is the inside of the balloon while it is being inflated. This is the tiny basket the passengers will have to stand in. The two upper compartments will hold 8 passengers total. This tight fit wasn't at all uncomfortable. Two balloons lifted off at almost the same time. 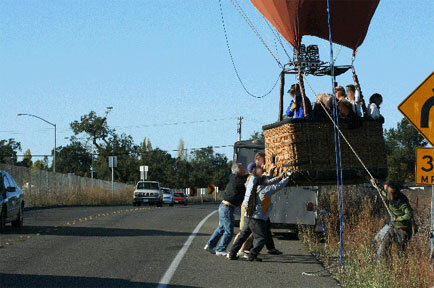 The passengers on my balloon are waving good-bye to everyone on the neighboring balloon. We had a bumpy landing in a field of weeds. Our basket had to be lifted over barbed wire. Friends and family pitched in to help with the process. 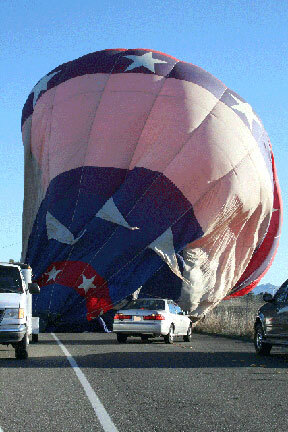 The end of our flight came as a surprise to traveling motorists.